The International School of Kuala Lumpur launched our Global Action Program in Nepal this October under the guidance of Bill Kite and friends. Our Grade 9 students were given the opportunity to experience the beauty of Nepal and also see first hand that service initiatives are a rewarding and necessary component of being a socially responsible global citizen. Our group of 20 students and 2 teacher chaperones were greeted by a joyous and respectful group of students. The ISKL students were very honored with the greeting and the fact that the students had come in on their holiday to meet us and learn about dental health. After a rousing morning aerobics session, and introduction to the dental health initiative, the fun started. Despite the linguistic barriers, the modeling and energy of our students paired with the exuberance of the Shree Pokhara students made for a great first step towards promoting dental health awareness in this under-served population. There were smiles across the board as the youngsters learned a simple three step procedure for brushing along with the mechanics of getting toothpaste on to the brush and holding it properly. The personal development was not only present in the primary students as each of the engaged ISKL students grew that day. We were touched to have made a positive impact on the school community, and be part of the foundation for further efforts at the school. 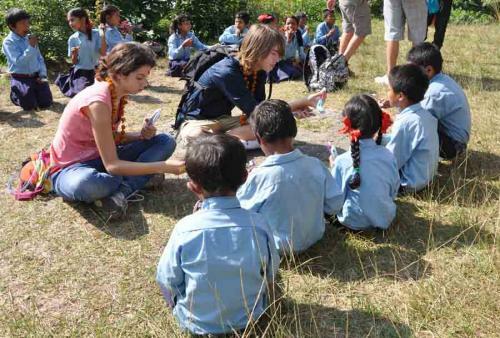 The ISKL Global Action Program students are formulating a plan to provide funds to ensure future availability of dental health products for the Shree Pokhara View Point students until our return next year. We look forward to next year, and years ahead for continued support of this dental health initiative.